After I finished Indelible I couldn’t wait to return to the world of the Twixt. It reminded me of a combination between Spirited Away by Hayao Miyazaki and a faerie world. Invisible made all that waiting worthwhile! 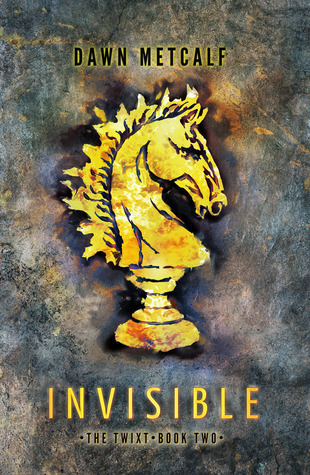 Invisible begins with a bang, after the events in Indelible Joy is protected by an edict from the council and the council wants to talk. The problem is Joy is being attacked irregardless of the edict by a knight bent on killing her. It is only with the help of Ink, Inq, and the Balliwick that Joy is able to keep him at bay. And even that might not be enough. In Invisible Metcalf took the plot of Indelible and deepened it. The world building became broader, secondary characters got more backstory, and the stakes were raised. Joy has to choose between leaving the twixt, being marked, or forging her own path. Each of these paths is fraught with its own unique kind of danger. I really loved that in Invisible we get to see more of Ink and Joy as a couple. In the last book they had to fight so hard to be together that it was nice to see them get a little slice of peace. Even if that peace was fragile and constantly being threatened. Overall, Invisible was a lot of fun. It was great to see Ink, Inq, and Joy again and to learn more about the world of the Twixt. I am really looking forward to the next edition in this series. I can't wait to see where Metcalf takes the story next! I read this one earlier in the year. I liked that Joy felt like a real teenager and the Ink developed but stayed true to himself.